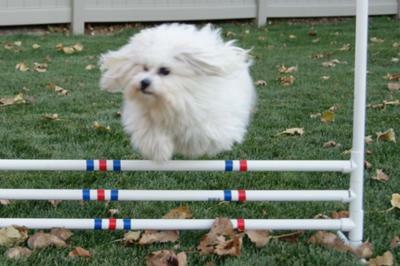 A Good Candidate for Dog Agility Training? Agility training for dogs has become very popular whether it’s for competition or just for enjoying backyard agility exercises. In competition, the dog races through an obstacle course to win. It requires a lot of time and dedication; not to mention teamwork between you and your pup. It's helpful to already be proficient at obedience skills before attempting competitive agility training for dogs. Backyard agility training isn’t so much a race against the clock or another dog, as much as it’s a way to bond, provide exercise, and have fun together. All dogs can participate in agility training no matter what breed or size. You don’t have to spend a lot of money on agility training. Recreational training has all the advantages of competitions and you can find relatively inexpensive agility training starter kits for the backyard agility course for dogs. You can even make your own. Want to see an example of this agility training in action? Watch these pups having a blast in their backyard. Amazing! I just know Luc could do this - he’s soooooo fast (especially when chasing ducks). Just starting out? check out these dog agility books for more information.